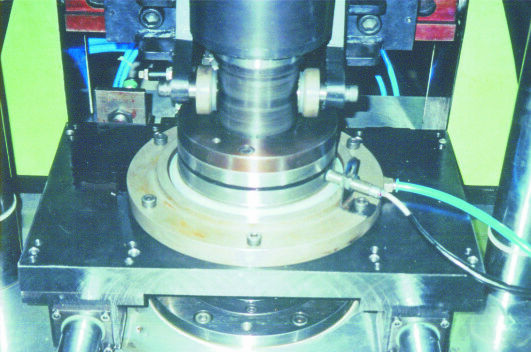 This machine was developed for Fenner India Ltd for manufacture of seals. It has a Rotary Table which will move in and out of the machine for loading purposes, with the Spindle Housing Mounted on an Air Cylinder capable of Axially Moving Up and Down thus Engaging and Disengaging on a Conical clutch. The Machine is Fully Automatic where the Component will Get Clamped in Position , Starts Rotating and a Forming Roller will come and Roll the Outer Part. These Seals are Consisting of Three Parts, An outer Ring, inner Ring and a Teflon Sealing Element in the Middle which is the Sealing element.